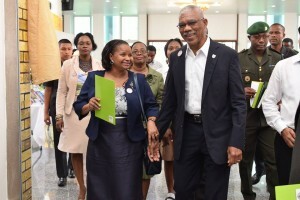 President David Granger and Minister of Public Health, Volda Lawrence. Public Health Minister, Volda Lawrence on Tuesday stopped short of suggesting that attempts are being made to muddy her political waters ahead of her bid to become the Chairperson of her People’s National Congress Reform. “Minister Lawrence will provide further and complete details in the National Assembly on this matter on Thursday, July 19th but takes note of the curious timing of this non-story, almost an entire year after the contract was awarded and, importantly, when a certain critical political decision is imminent. Minister Lawrence trusts that this issue is not part of what would be a sinister campaign to influence this decision,” her Ministry said in a statement. Lawrence’s opponents have been peddling a picture of a PNCR official’s brother and a man believed to be Hardat Singh, an executive of the company that had been awarded the contract. Lawrence is coming up against incumbent PNCR Chairman, Basil Williams and Joseph Harmon in what is increasingly set to be a keenly contested election at their party’s Biennial Delegates Congress scheduled for next month. In defending herself, Lawrence called reports on the allegations in sections of the media “mischievous, salacious and inaccurate”. The Public Health Ministry said there was no corruption in the award of the contract to the United States-based HDM Labs Inc.
“The facts on the matter are clear and set out that all the relevant procedures were properly followed by the Ministry of Public Health,” the Ministry said. In April 2017, six companies responded to the request for the supply of emergency pharmaceutical supplies for Regional and Clinic Services. The Public Health Mijnistrt said the six companies were Ansa McAl Limited, Caribbean Medical Supplies, Global Healthcare Supplies, International Pharmaceutical Agency, HDM Labs Inc. and Meditron Inc.
“The National Procurement and Tender Administration Board (NPTAB) recommended that no award be made as all bidders failed to meet the evaluation criteria at the preliminary stage. The Ministry of Public Health then sought permission from NPTAB for Restrictive Tendering. NPTAB granted permission. All six companies were then asked, by letter, to resubmit bids. Only one company (HDM Labs Inc) responded. NPTAB then recommended that the contract be awarded having completed its evaluation report. A memo was submitted to Cabinet to this effect on August 29, 2017. Cabinet noted the recommendation of NPTAB. The contract was awarded on August 31, 2017, with all the relevant and applicable procedures having been duly and properly followed,” the Public Health Ministry said. Nominations for Leader, Chairman, Vice Chairman and Central Executive positions closed on Monday at 2 PM.